Oh, the natural beauty of the Connecticut River! A place where time takes its time. The meandering expanse of the beautiful Connecticut River in the Fall. This is a spectacular way to see the foliage! The Connecticut River is blessed by having a problem with shoaling at its mouth. Blessed you say? Yes, it is because of the shallow shifting bars at the mouth that the River was never developed for industrial purposes. Consequently it remains as pristine as it did centuries ago…or at least as close as we’re going to get at this point in civilized time in coastal US waters. It is amazingly beautiful; from the lighthouse on the point marking Old Saybrook, to Old Lyme on the starboard flank, to Essex at the first bend, to Hamburg Cove, Selden Creek, East Haddam and beyond, it offers up one breathtaking vista after another, each town more charming than the last, each anchorage more peaceful than you might have imagined. It’s here that the Connecticut native Americans and Yankees, like Katherine Hepburn lived their lives in congruence with the land, the people, the wildlife, and the water. We’ve had the good fortune to travel up that river at different times of the year, and each time it was like seeing it through new eyes. Yes, there are familiar sites along the way, but in between are always new things to see in new light with new palettes of color. Let us paint you some pictures. In early spring and summer, the hills turn verdant and vibrant as the waterfowl return to their nesting grounds, and they have plenty to celebrate here. Much of the natural habitat has been preserved, and there are several good books written about the naturalist's dream environment (see one below). The shallows are covered with marshlands that are teaming with life and sway gently in the breeze, painting a moving portrait as you pass by. 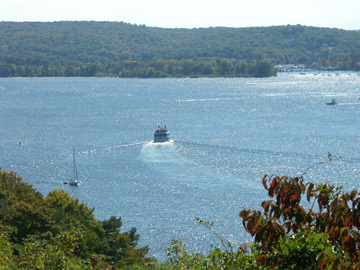 The shores are quite lush and the terrain pleasantly hilly, which makes for interesting viewing into the distance, especially from walks high above like the one leading to the Gillette Castle. Perhaps the most spectacular of the times of year to visit is Fall, when the foliage bursts into walls of flame along those hills and Indian Summer sun lights up the deep blue of the river with a meandering slash through the hills. As you enter the river past the breakwater with it's own lighthouse and pass the lovely Old Saybrook lighthouse on the inside, the vista opens up onto broad views of marshland to the East and Saybrook to the West. The Eastern side is very shallow here. 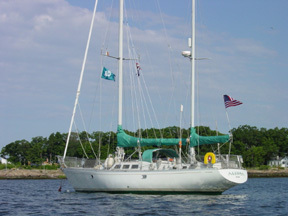 It is best to follow the channel markers and hug the Western side for the depth. There are major marinas to starboard, with fuel docks and extensive facilities that can accomodate mega-yachts and include among their amenities a spa, but this is not our preferred first stop. We like to continue up to some of our favorite destinations of all time… the colonial towns that dot the river's edge . In fact, there is so much to do and enjoy on the river that we've decided to share a weeklong itinerary with you. Click on any of the links below to view that destination. 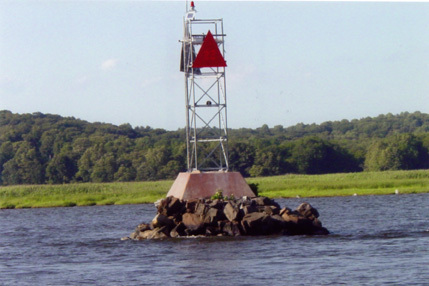 We're going to pass by Old Lyme and Old Saybrook on the way up as Essex is our first stop and probably our favorite destination on the river. 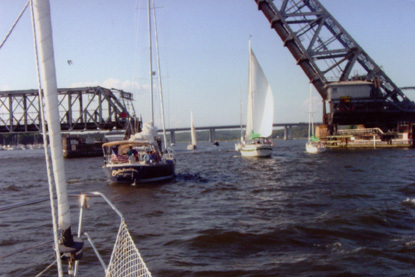 To add variety to our itinerary, we're going to stop at the famed Hamburg Cove, the secluded Selden Creek (and our gunkhole of choice), and the most interesting East Haddam, before we return downriver, to pamper ourselves at the Saybrook Point Inn Marina, Spa, and Conference Center. Come along and see what you've been missing! 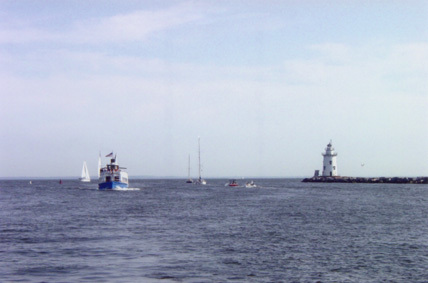 Right: Inner light at Lynde Point, Saybrook, with the marina complex in the background. There is an easily accessible fuel dock there, a full service marina, and a world class resort hotel and spa for the ultimate in luxury stops. Right: Texaco fuel station at Old Lyme Dock on the eastern shore before the bridge with the biggest flag we've ever seen! The horses on the lawn of the house beyond are full sized statues. Really, they are! 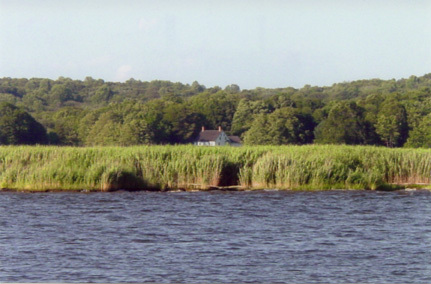 Right: Two-chimney Georgian home tucked into the marshes and the lush summer landscape. 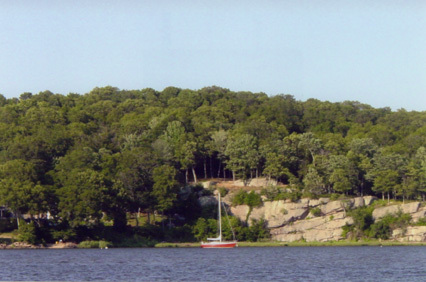 Right: Boat nestled along the shore below cliffs. 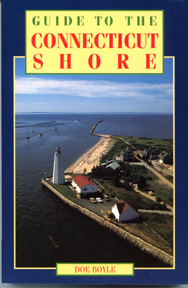 Guide to the Connecticut Shore by Doe Boyle is a basic general reference for places to visit, to eat, and to stay including restaurants, beaches, parks and preserves, museums, shopping, excursions, amusements, etcetera. Published by the Globe Pequot Press in Old Saybrook, CT and now about to be released in its fourth edition. 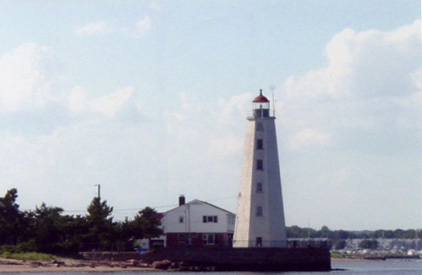 Cover photo shows Old Saybrook Lighthouse in the foreground looking out over the breakwater to Long Island Sound. 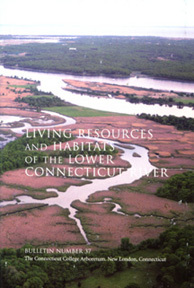 Good collection of links (but very slow to connect to them) http://www.essexct.com/ Living Resources and Habitats of the Lower Connecticut River. Bulletin Number 37, The Connecticut College Arboretum, New London, CT. Available at select locations throughout the region (we got it in Hamburg) or by calling (860) 439-5020.